When foundations consider turning their print annual reports into online versions, the question often is how to go beyond a cut-and-paste job and produce a final product that engages audiences by taking advantage of the best the Web has to offer. And as Josie Burke, director of communications at El Pomar Foundation, learned, you also can’t simply turn former print stories into lengthy video pieces. Burke, a former TV reporter who previously worked at CNN, wanted to incorporate video into the report for the foundation — which has about $450 million in assets and supports a broad range of grantmaking to enhance the lives of people in Colorado. She initially planned on creating three- to four-minute TV-news-style segments. But after doing a little research about online video viewing habits, Burke learned that people don’t have the same patience for long-format segments that appear on television. As a result, El Pomar’s online report features nearly two dozen short videos, each less than a minute long, and which feature different aspects or elements of the foundation’s grantmaking. Accompanying photos, maps and text help round out each of the stories. While video and photos help explain the foundation’s history and approach, the online report also gives viewers the opportunity to delve as deeply as they’d like into El Pomar’s grantmaking in five key areas. People can choose for themselves which aspects of the foundation’s grantmaking over the previous year they would like to explore. 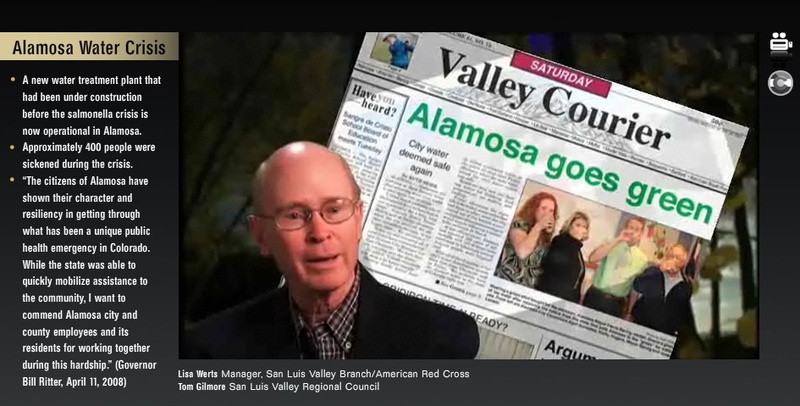 For example, to tell the story of how El Pomar responded to a water contamination emergency in Alamosa, a town of about 8,000 people south of Colorado Springs, Colo., the annual report uses videos, photos, maps and brief text. The section’s three brief videos feature interviews with El Pomar grantees talking about what they did and why it mattered. “We’re not forcing people to listen to the entire story if they are only interested in one aspect of it,” Burke said. Planning for 2008’s annual report began earlier this year and was spurred in part by the Communications Network’s discussion of annual reports at its 2008 Fall conference in Chicago, Burke noted. She also talked with other foundations and was particularly motivated by the online annual reports published by other Colorado foundations (such as ones that the Gill Foundation and Caring for Colorado produced). Given her background in television and her existing relationships with a video production company, Burke was able to produce and edit the videos, helping to defray costs. Overall, the multimedia annual report was roughly one-third less cost than the printed report and took roughly the same amount of time, she said. Copy in the online report is purposefully brief, she said. She tried to be as concise as possible without sacrificing core information. To promote the report, El Pomar featured it on the home page of its Web site, featured it an e-newsletter, and through mailings to different email lists. El Pomar also posted the report to its Facebook group and put the videos on YouTube. Early response has been positive, Burke said, especially from El Pomar’s board.